Most linux projects follow a similar release process, and to illustrate that, I will specifically describe the FSlint release process as depicted in the diagram above. Following is a presentation of the actual shell commands I run on my system to affect the releases to the various distributions. It's worth noting here that the config files used to create the packages for the linux distributions are maintained within the source tree of the FSlint project itself. However these config files are not included in the released source packages so that any changes specific to the distribution packages can be done independently of FSlint releases. Hosting your project on a public OSS hosting site is a very good idea. Some possible choices for project hosting are, SourceForge, Google, GNU or Berlios. Personally I don't like the structure of the SourceForge site, though it is improving lately. So I went with Google's project hosting as it became available when I was considering using a public hosting site for my project, and I really like Subversion. Here we create the release in the google subversion repository and copy it locally. Since fedora 11 we need to do the following to create backwards compatible packages, that are hashed using md5 rather than sha256. 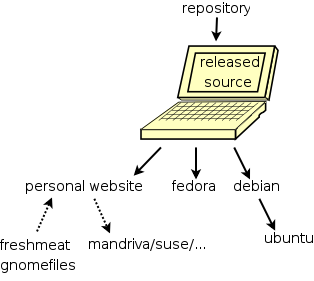 Currently fedora uses a CVS repository and a higher level client to interact with the project. Until Fedora Core 6 this client was called "plague" but since F7 "koji" is used. I'm a fedora maintainer and so can affect releases to the devel branch and the various fedora releases directly, using the following commands. cvs commit -m "Update to $ver"
I chroot to ubuntu from fedora and run the following, to create a source package. This also creates and signs a binary package for people who don't use debian, or want immediate access to the latest debian package. The requirements of debian packages change often so it's important to use lintian to ensure conformance. I'm not a debian maintainer, so I must upload my source package to mentors.debian.net as follows, and then wait for someone to sponsor the package, i.e. upload it to debian. I don't release directly to ubuntu, but they sync periodically with "Debian unstable". One can also request a sync from debian, or request sponsorship for non debian packages. Possibly I could use an XML RPC interface to automate this, but I do releases infrequently enough, and the web forms are simple enough to do this manually. Currently I publish to freshmeat and gnomefiles from where it generally filters to other news sites.